Welcome to our website. Since 1960, our company has provided outstanding customer service. 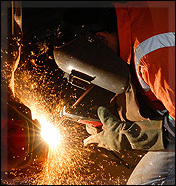 Clay's Welding Co., Inc. is a 2nd generation family owned and operated business. We provide residential homebuilder services as well as welding repairs and fabrication. Our newly expanded shop machinery includes a CNC plasma cutting machine as well as MIG and TIG welders, giving us the ability to produce a number of custom projects - even objects from DXF files. We use both Supply Pro and Buildtopia and provide outstanding customer service. Our sister company provides custom metal signs, yard art, etc. Please checkout our website for more information.